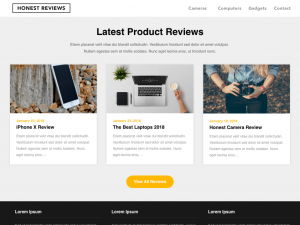 Reviewers Landing page is a responsive multi purpose one page / Landing page WordPress business theme. Simple 1 pages and presentation pages have become very popular since its great for presenting products/apps in a creative and elegant way. Starting a landing page or single page is easy with our modern theme due to the features and flat easy going design, large header and clean design. Reviewers Landing page is simple to setup but has a lot of features for both affiliate marketing, i.e. lots of advertisement space for affiliate programs such as Google AdSense. Authors & bloggers can easily create a simple and minimalistic blog and customize it to a niche with the header, so you can write about anything…. A last thing to say is that the theme is of course fully SEO optimized ( search engine optimized ) and responsive so it works on all types of phones, tablets and desktop computers. The code is clean and optimized so you can get a good page speed and loading time.